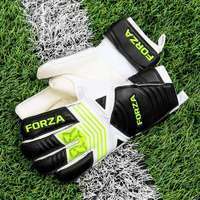 Our world-class range of FORZA Football Goals really does have all angles covered when it comes to football, especially the smaller versions of the game. 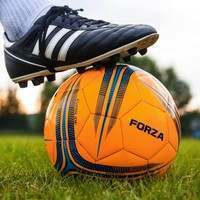 If 5-a-side is more your strong point, then this selection of elite-level FORZA football goals is certainly will certainly provide you with what you need to deliver the tiki taka magic. 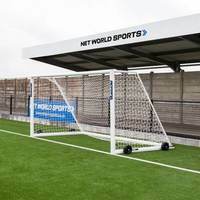 As the UK’s number 1 goal supplier it was vitally important that we created our small-sided football goals with the same expert knowledge and focus as the rest of our range, and because we did this, we can guarantee that these football goals are the best there is, no matter what surface you play on – indoor, grass or artificial 3/4G. 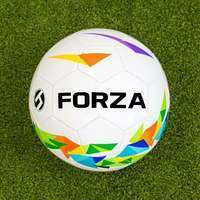 Hailing from a variety of FORZA’s leading football goal ranges –the quality of these 5-a-side football goals knows no bounds. 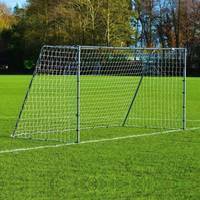 Starting with the Alu60, the outstanding aluminium constructed goal is available in two sizes; 12 x 4 (Junior) and 16 x 4 (Senior), with both sizes being perfect for 5-a-side matches and training purposes. 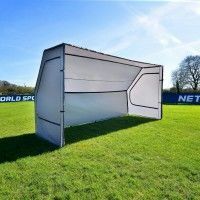 The extremely durable structure is sturdy enough to cope with the hardest of ball impacts, but lightweight enough to ensure moving it around is a simple task, which is ideal for 5-a-side football pitches, as the majority of the time they are played on multi-purpose playing surfaces. 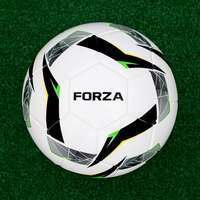 The FORZA Alu110 Freestanding 5-a-side Football Goal takes it up another level. 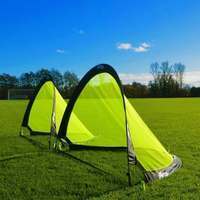 Just like the Alu60, the Alu110 is available as either a 12 x 4 or 16 x 4 (junior or senior) but also comes with the option of adding heavy-duty, lever type puncture proof wheels which allow you to move the goal around with exceptional ease. 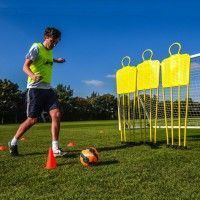 The light-in-weight, fully welded aluminium structure is incredibly strong and durable, with internal counterbalance weights available to use to provide maximum stability once the metal football goal is in place. 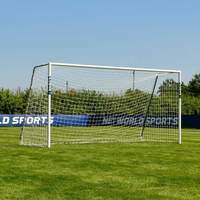 Even the hardest of hits won’t budge this goal during your 5-a-side matches. 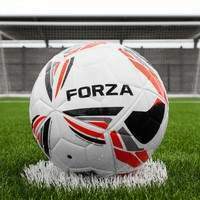 The impressive, optic white goal will certainly up the level of quality of any football pitch it graces. 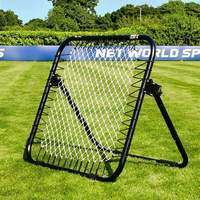 If garden football is more your thing, then our FORZA Football Goal Locking range has the perfect goals for you. 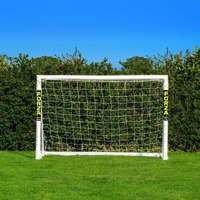 Manufactured from strong uPVC, the 8 x 4 and 12 x 6 FORZA goals are incredibly strong yet light-in-weight for exceptional durability. 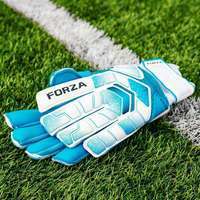 For a better quality, match version of these FORZA goals, the 8 x 4 FORZA Match football goal or 8 x 6 Steel 42 football goal will deliver a consistently high performance. 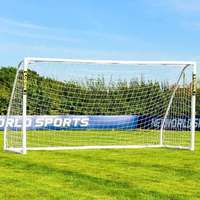 All goal nets are made from the best quality twine and possess weatherproof and rot-resistant qualities, allowing them to be left outside all year round. 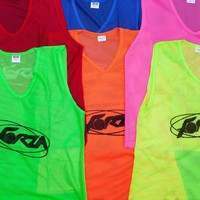 A range that consists of PVC, Steel and aluminium, this range of FORZA 5-a-side Football Goals has a goal for every player and every age. 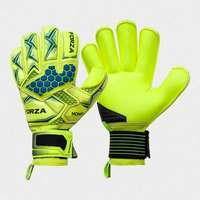 Recognised by the FA as an official goal supplier, the quality of our goals is clear for all to see. 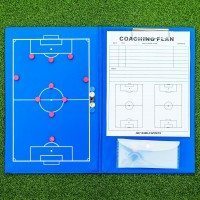 Professional and exceptionally durable, whatever surface you play on, these football goals will be an excellent addition to any football set-up.